When the weather gets chilly we pull out our favorite comfort food recipes to combat the cold. It is also a good time to experiment with making favorite dishes we have never attempted at home. 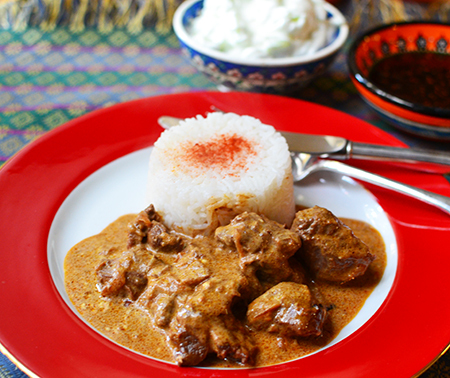 Indian cuisine has been our go-to comfort food for two decades now, so when cold weather reached the desert, we thought we would cobble together a recipe for our favorite lamb dish: lamb shahi khorma. During the winters of the late nineties and early aughts, we went often to Mr. India, our favorite Indian restaurant in Portsmouth, New Hampshire. The wind howled, the temperature was unspeakably low, the snow squeaked under our feet as we stumbled over snow banks, some taller than we. Once inside the restaurant, the chill faded away and we were embraced by the warmth of the family who ran the restaurant and the scent of exotic spices. The fragrant steaming dishes warmed our souls and bellies alike. 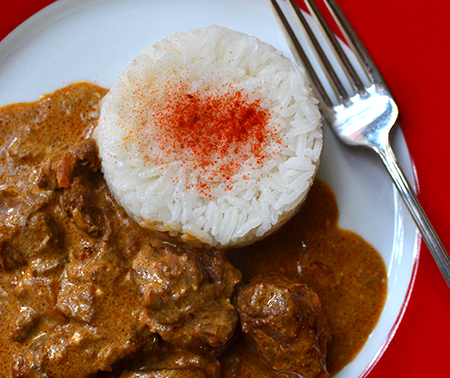 Lamb Shahi Khorma was one of our favorites there; we also ordered it occasionally made with chicken. This is a great option for those who don't like lamb, or don't eat red meat. (Does that remind you of the scene in My Big, Fat, Greek Wedding - "What? You don't eat meat? That's okay, I make you lamb.") If you make this recipe using chicken, I recommend using thighs and reducing the braising time. Like many Indian dishes, this one is not difficult but it requires time. You need a chunk of time from start to finish, much of which is braising time in the oven. This is a good thing, as it warms the kitchen and fills the house with enticing perfumes. And it is the perfect time to page through the new issue of your favorite cooking magazine. 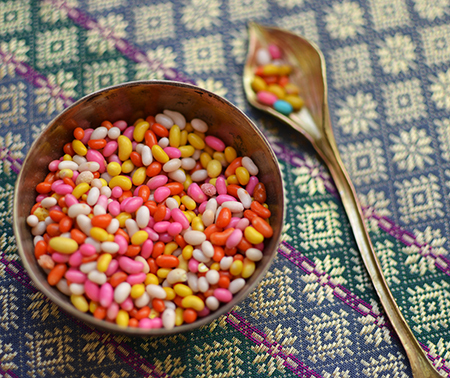 We found these candied fennel seeds to be a refreshing finale for our Khorma. We served ours with basmati rice, with raita and a tamarind chutney (recipe to come). A little naan on the side was perfect for getting every last bit of the sauce. Preheat oven to 275°F. Heat the ghee in a large heavy-bottomed pot over medium-high heat and add the onions. Cook, stirring often, until onions turn caramel brown - about 20 minutes. 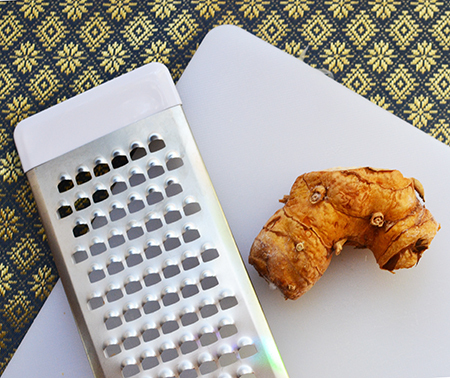 Add the ginger and cook an additional 2 minutes. 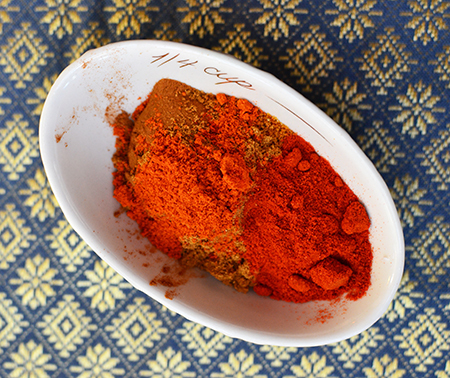 Add cumin mace, cinnamon, garam masala, cayenne, and paprika; stir to distribute the spices, and cook for 1 minute. Dry the lamb chunks thoroughly with paper towels. Increase heat to high and add lamb to the pot. Brown on all sides, turning and tossing them quickly, for about 5 minutes. Add half the yoghurt, half of the cream, and the salt; bring to a boil. Remove from the heat, cover, and place in the pre-heated oven to braise for 2 hours. Stir the meat occasionally while it is in the oven to keep the sauce from burning. If the sauce completely evaporates, add a little milk. Remove the pot from the oven, and stir in remaining yoghurt and cream. Serve with basmati rice, raita, chutney, and naan. Unfortunately we have no choice but to keep warm. More like molten. The humidity this summer is bringing is really testing me, and the daily storms are making me feel like we're in Southeast Asia, not Sydney. I probably make a curry once or twice a fortnight - I love them, as does Dean - although he'd look at me stunned if he saw me putting that much butter and cream into one. Probably a good thing I suggest he sits in the other room when I get generous with such things in cooking. I'm definitely making this one. I know you both will enjoy this. Love khorma!! We always order the vegetable khorma when we go out - so good. Great plating! Hmmm.. candied fennel. Interesting. Hope your weekend is going well, David! Thanks, Cathleen! I have to try a vegetable khorma! Ugh - I do wish you were closer. I would have happily fed you! Looks delicious! My husband Bruce is in India on a month-long meditation retreat. Eating Indian food would be a nice way to feel connected while he is gone. Great timing, David! Ah - so he will be playing while you are... um... playing! :) We are looking forward to seeing you soon! This made me recall the very first time I tried Indian food at a restaurant in Denver. I picked what looked like a safe choice, chicken korma. It was delicious. Since then I have tried to recreate various Indian dishes but they don't ever seem as wonderful as my first taste. My hubby loves lamb shanks and whenever he can find "clean" ones (not from supermarkets, that is) he loves to make a lamb shank recipe he heard on NPR. He will be very interested in this recipe of yours. We are lucky to have a good source of grass fed lamb here. This is really good, and I know you and your hubby will like it, Caterina! Dear David, actually we never eat Indian - except maybe the dishes from Hugh like the Flat onion bhajis with mango chutney raita that I made for the CCC this month - but I do know that quote from My big fat Greek weeding since I have seen that movie countless times (love it!) - your recipe does look like perfect winter comfort food for that snowy day! A lot of people don't like Indian - or other cuisines - but that is the fun of the world There are so many to try! Thanks, Andrea! I love, love, love Indian food, but simply do not venture into the cuisine enough. I find myself ordering my favorite chicken korma at our favorite Indian spot in Burbank and always thinking, "there's no way I could match this." I really should try, though! 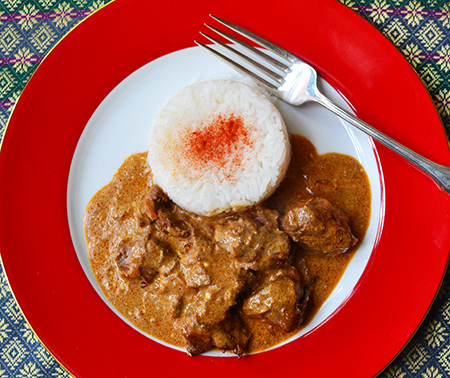 Yours looks wonderful, and now I'm craving korma! You can do it, Christina! 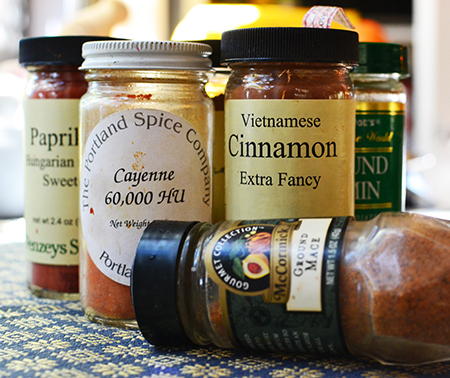 It is really easy, and so much fun to blend your own spice mixtures. How lucky are you, John, to have Little India so close to home! I hope you do make the khomra - please let me know what you think! I returned to tell you that I prepared this Khorma for dinner last night. It was every bit as good as I had hoped. Most of the ingredients were on-hand so there was no last minute run to the store. Thanks, David, this is one recipe I'm sure to enjoy again and argain. So glad you enjoyed it, John! Thanks for letting me know - now your note is making me want it for dinner tonight! This sounds so good, what a deep colour the curry went too. Perfect for this time of year. Thanks, Caroline! 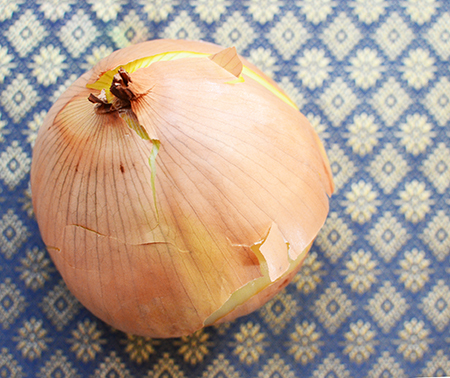 I can't decide if it was the curry or the browning of the onions that gave this khorma its rich color! I am really looking forward to the tamarind chutney recipe. And this obviously looks delicious. Thanks, Fiona - the tamarind chutney just needs to be photographed and I will be ready to post! But probably a few months from now... I think I am all posted through the end of March! Hi David, I was not big on Indian food until about 2 years ago, now I'm a big fan, love it. Your khorma looks warm and comforting, love the candied fennel. You have some really great Indian restaurants in Tempe, too, Cheri - have you found any of them? Thanks, Inger - luckily, our lamb ranchers are doing well! And this would be fantastic with chicken legs, too! I had completely forgotten about Mr. India here in Portsmouth, New Hampshire. I wish it were still here although we have at least one worthy replacement. Perhaps we should try our own Indian food and this looks like a great start!